With no onward chain and huge scope for further improvement this fantastic property really would make an amazing investment. Having already undergone extension works the property has a fantastic open plan kitchen overlooking the garden, with an abundance of fitted units. The lounge/diner is a great size with lovely bay window to the front. There is a ground floor shower room, which could also work very well as a utility room, along with a first floor bathroom. 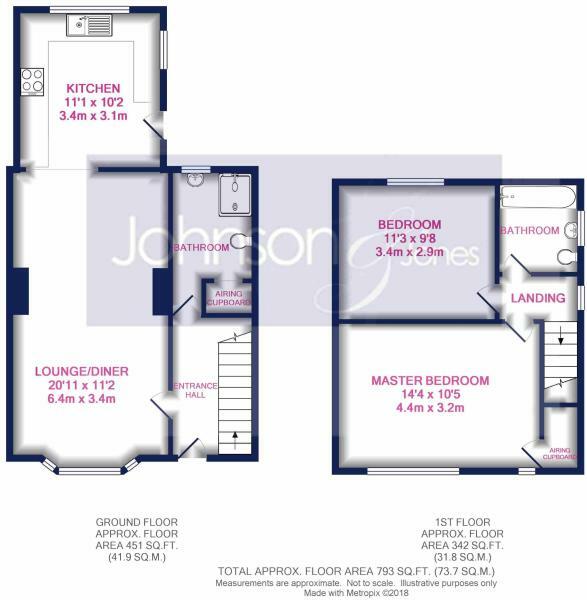 There are two very spacious double bedrooms with the master benefitting from a fitted cupboard. Externally the front and rear gardens are both great sizes, with the front allowing for off street parking. In addition there is a very handy brick built storage shed. With double glazed windows and gas central heating, this property really needs to be seen to appreciate the space and potential it has to offer. Disclaimer - Property reference 101pyrcroftroad. The information displayed about this property comprises a property advertisement. Rightmove.co.uk makes no warranty as to the accuracy or completeness of the advertisement or any linked or associated information, and Rightmove has no control over the content. This property advertisement does not constitute property particulars. The information is provided and maintained by Johnson & jones Ltd, Chertsey. Please contact the selling agent or developer directly to obtain any information which may be available under the terms of The Energy Performance of Buildings (Certificates and Inspections) (England and Wales) Regulations 2007 or the Home Report if in relation to a residential property in Scotland.